Shrouded in mystery for centuries, the Sphinx of Giza has frustrated many who have attempted to discover its original purpose. Accounts exist of the Sphinx as an oracle, as a king’s burial chamber, and as a temple for initiation into the Hermetic Mysteries. Egyptologists have argued for decades about whether there are secret chambers underneath the Sphinx, why the head-to-body ratio is out of proportion, and whose face adorns it. Robert Temple reveals that the Sphinx was originally a monumental Anubis, the Egyptian jackal god, and that its face is that of a Middle Kingdom Pharaoh, Amenemhet II, which was a later re-carving. In addition, he provides photographic evidence of ancient sluice gate traces to demonstrate that, during the Old Kingdom, the Sphinx as Anubis sat surrounded by a moat filled with water--called Jackal Lake in the ancient Pyramid Texts--where religious ceremonies were held. He also provides evidence that the exact size and position of the Sphinx were geometrically determined in relation to the pyramids of Cheops and Chephren and that it was part of a pharaonic resurrection cult. PROFESSOR ROBERT TEMPLE is author of a dozen challenging and provocative books, commencing with the international best-seller, The Sirius Mystery. His books have been translated into a total of 44 foreign languages. He combines solid academic scholarship with an ability to communicate with the mass public. He is Visiting Professor of the History and Philosophy of Science at Tsinghua University in Beijing, and previously held a similar position at an American university. For many years he was a science writer for the Sunday Times, the Guardian, and a science reporter for Time-Life, as well as a frequent reviewer for Nature and profile writer for The New Scientist. He is a Fellow of the Royal Astronomical Society, and has been a member of the Egypt Exploration Society since the 1970s, as well as a member of numerous other academic societies. 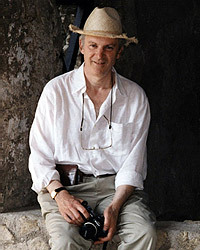 He has produced, written and presented a documentary for Channel Four and National Geographic Channels on his archaeological discoveries in Greece and Italy, and he was at one time an arts reviewer on BBC Radio 4’s ‘Kaleidoscope’. In 1993, his translation of the Babylonian Epic of Gilgamesh was performed at the Royal National Theatre in London. With his wife, Olivia, he is co-author and translator of the first complete English version of Aesop’s Fables, which attracted a great deal of international press attention at the time of its release, as the earlier translations had suppressed some of the fables because of Victorian prudery. Temple was a colleague of the late Dr. Joseph Needham of Cambridge, in association with whom he wrote The Genius of China, which has been approved as an official reference book (in Chinese) for the Chinese secondary school system, and which won five national awards in the USA. He has done archaeometric dating work and intensive exploration of closed sites in Egypt with the permission of the Egyptian Supreme Council of Antiquities. 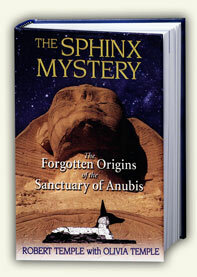 His research into historical accounts of the Sphinx is the first comprehensive survey ever undertaken. 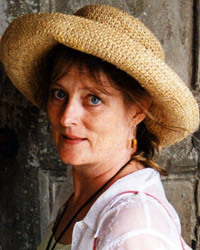 OLIVIA TEMPLE is an artist and writer, who has contributed to many wellknown magazines in the UK. She was co-author with her husband of Aesop: The Complete Fables (Penguin Classics). She organised the Egyptian, Greek and Italian archaeological research trips for the Project for Historical Dating, and took part in all the archaeometric dating work in Egypt with the permission of the Egyptian Supreme Council of Antiquities. She works closely with her husband, she translated all the French early travellers’ reports on the Sphinx, consulted on and edited the book, and took many of the photos which appear in The Sphinx Mystery. She has co-designed this website. Olivia is also director of an opera and theatrical design archive. 23-24 May 2009 Robert will be speaking at the Megalithomania 2009 conference in Glastonbury. The Megalithomania web site can be found at www.megalithomania.co.uk for further information and advance tickets. 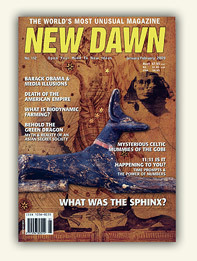 Jan 2009 'What Was The Sphinx' article by Robert Temple published as the cover story in the January -February 2009 edition of New Dawn magazine.